Abbas meets visiting Vice President, but fails to condemn terrorist attacks despite earlier criticism by Biden. Palestinian Authority (PA) chairman Mahmoud Abbas on Wednesday blamed “Israeli occupation” for the current terrorist wave, Walla! News reported. Speaking during a meeting in Ramallah with visiting American Vice President Joe Biden, Abbas stopped short of condemning the latest terrorist attacks, though he did express condolences over the death of American citizen Taylor Allen Force in Tuesday's stabbing attack in Jaffa. The PA chairman also did not refer to the Jaffa attack as a terrorist attack, and would only say that "in the last five months, Israel killed 200 Palestinians". According to Walla!, Abbas asked Biden to restore the political outlook of the two-state solution based on the pre-1967 borders as a key to peace in the region, and stressed that "the Israeli occupation is the main cause of violence and bloodshed in the region." In addition, he also called to fight terrorism of all kinds, and said that in order to defeat the Islamic State (ISIS) organization, an independent Palestinian state must be established. 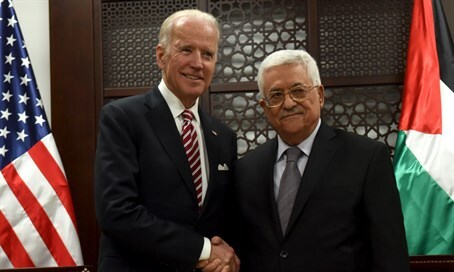 The report, which cited the PA-based WAFA news agency, also said that Biden told Abbas that the United States remains committed to the two-state solution and that its position on “settlements” remained unchanged. Abbas's failure to condemn the attacks comes despite the fact that earlier on Wednesday, Biden implicitly criticized PA leaders for not condemning attacks against Israelis, as an upsurge in terrorist attacks marred his visit to Israel. "The United States of America condemns these acts and condemns the failure to condemn these acts," Biden said after meeting Prime Minister Binyamin Netanyahu. "The kind of violence we saw yesterday, the failure to condemn it, the rhetoric that incites that violence, the retribution that it generates, has to stop," he added.